This article is about the spread. For the peer-to-peer protocol, see Gnutella. Nutella (/nutɛlə/; Italian pronunciation: [nutˈɛlla]) is a brand of sweetened hazelnut cocoa spread. Nutella is manufactured by the Italian company Ferrero and was first introduced in 1965, although its first iteration dates to 1963. Pietro Ferrero owned a bakery in Alba, an Italian town known for the production of hazelnuts. In 1946, he sold the initial 300 kilograms (660 lb) batch of Pasta Gianduja. Originally sold as a solid block, Ferrero started to sell a creamy version in 1951 as Supercrema. In 1963, Ferrero's son Michele Ferrero revamped Supercrema with the intention of marketing it throughout Europe. Its composition was modified, and it was renamed "Nutella". The first jar of Nutella left the factory in Alba on April 20, 1964. The product was an instant success and remains widely popular. In 2012, French senator Yves Daudigny proposed a tax increase on palm oil from €100 to €400 per tonne. At 20 percent, palm oil is one of Nutella's main ingredients, and the tax was dubbed "the Nutella tax" in the media. On 14 May 2014, Poste italiane issued a 50th anniversary Nutella commemorative stamp. The 70 Euro cent stamp was designed by Istituto Poligrafico e Zecca dello Stato and features a jar of Nutella on a golden background. Ferrero held a Nutella Day on 17 and 18 May to celebrate the anniversary. The main ingredients of Nutella are sugar and palm oil (greater than 50%). It also contains hazelnut at 13 %, cocoa solids, and skimmed milk. In the United States and the UK, Nutella contains soy products. Nutella is marketed as "hazelnut cream" in many countries. Under Italian law, it cannot be labeled as a "chocolate cream", as it does not meet minimum cocoa solids concentration criteria. Ferrero uses 25 percent of the global supply of hazelnuts. In November 2017, the company modified the recipe slightly, increasing the sugar and skimmed milk powder content. Since the colour of the product is lighter in tone, the Hamburg Consumer Protection Center estimated that the cocoa content was also reduced. Some news outlets reported that the modification of the recipe led to consumers' being "outraged" or "going nuts". The traditional Piedmont recipe, gianduja, was a mixture containing approximately 71.5 % hazelnut paste and 19.5 % chocolate. It was developed in Piedmont, Italy, due to a lack of cocoa beans after post-war rationing reduced availability of the raw material. Many countries have a different ingredient list for the Nutella formula. Sugar, vegetable oil, hazelnuts (13%), skim milk powder (8.7%) cocoa powder (7.4%), non-fat milk solids, emulsifier (soy lecithin), flavour (vanillin). Sugar, modified palm oil, hazelnuts, cocoa, skim milk powder, whey powder, lecithin, vanillin. Ferrero has confirmed that it has changed the recipe of its chocolate and hazelnut spread – sparking a huge backlash among fans of the brand. 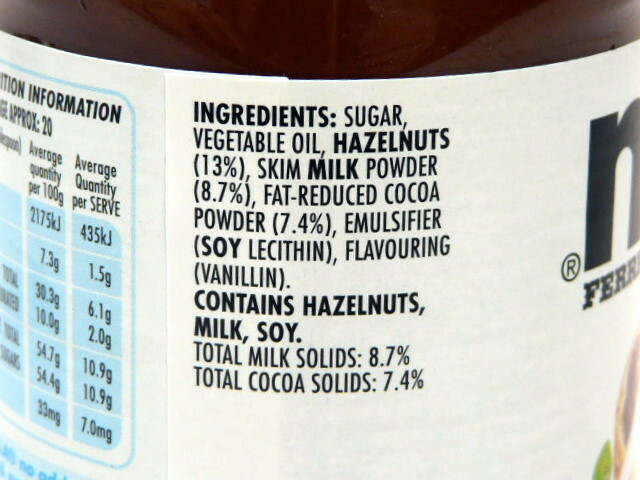 Sugar, vegetable oil, hazelnuts (13%), fat-reduced cocoa powder (7.4%), skimmed milk powder (5%), whey powder, emulsifier (lecithins) (soy), flavourant (vanillin). Nutella is produced in various facilities. In the North American market, it is produced at a plant in Brantford, Ontario in Canada  and more recently in San José Iturbide, Guanajuato, Mexico. For Australia and New Zealand, Nutella has been manufactured in Lithgow, New South Wales since the late 1970s. Ferrero also has a plant in Poços de Caldas, Brazil, which supplies the Brazilian market, with part of the production being exported overseas. Global production in 2013 was about 350,000 tonnes. Nutella is described as a chocolate and hazelnut spread, although it is mostly made of sugar and palm oil. The manufacturing process for this food item is very similar to a generic production of chocolate spread. Nutella is made from sugar, modified palm oil, hazelnuts, cocoa powder, skimmed milk powder, whey powder, soy lecithin, and vanillin. The process of making this spread begins with the extraction of cocoa powder from the cocoa bean. These cocoa beans are harvested from cocoa trees and are left to dry for about ten days before being shipped for processing. Typically cocoa beans contain approximately 50 percent of cocoa butter; therefore, they must be roasted to reduce the cocoa bean into a liquid form. This step is not sufficient for turning cocoa bean into a chocolate paste because it solidifies at room temperature, and would not be spreadable. After the initial roast, the liquid paste is sent to presses, which are used to squeeze the butter out of the cocoa bean. The final products are round discs of chocolate made of pure compressed cocoa. 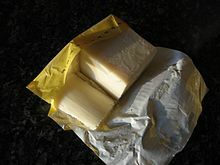 The cocoa butter is transferred elsewhere so it can be used in other products. The second process involves the hazelnuts. Once the hazelnuts have arrived at the processing plant, a quality control is issued to inspect the nuts so they are suitable for processing. A guillotine is used to chop the nuts to inspect the interior. After this process, the hazelnuts are cleaned and roasted. A second quality control is issued by a computer-controlled blast of air, which removes the bad nuts from the batch. This ensures that each jar of Nutella is uniform in its look and taste. Approximately 50 hazelnuts can be found in each jar of Nutella, as claimed by the company. The cocoa powder is then mixed with the hazelnuts along with sugar, vanillin and skim milk in a large tank until it becomes a paste-like spread. Modified palm oil is then added to help retain the solid phase of the Nutella at room temperature, which substitutes for the butter found in the cocoa bean. Whey powder is then added to the mix to act as a binder for the paste. Whey powder is an additive commonly used in spreads to prevent the coagulation of the product because it stabilizes the fat emulsions. Similarly, lecithin, a form of a fatty substance found in animal and plant tissues, is added to help emulsify the paste as it promotes homogenized mixing of the different ingredients, allowing the paste to become spreadable. It also aids the lipophilic properties of the cocoa powder which, again, keeps the product from separating. Vanillin is added to enhance the sweetness of the chocolate. The finished product is then packaged. Nutella contains 10.4 percent of saturated fat and 58 % of processed sugar by weight. A two-tablespoon (37-gram) serving of Nutella contains 200 calories including 99 calories from 11 grams of fat (3.5 g of which are saturated) and 80 calories from 21 grams of sugar. The spread also contains 15 mg of sodium and 2 g of protein per serving (for reference a Canadian serving size is 1 tablespoon or 19 grams). The label states that Nutella does not need to be refrigerated. This is because the large quantity of sugar in the product acts as a preservative to prevent the growth of microorganisms. More specifically, the sugar acts as a preservative by binding the water in the product, which prevents the microorganisms from growing. Refrigeration causes Nutella to harden because it contains fats from the hazelnuts. When nut fats are placed in cold temperatures they become too hard to spread. Hazelnuts contain almost 91 percent monounsaturated fat, which are known to be liquid at room temperature and solidify at refrigerator temperatures. Room temperature allows the product to have a smooth and spreadable consistency because the monounsaturated oils from the hazelnut are liquid at this state. In addition, the palm oil used in Nutella does not require refrigeration because it contains high amounts of saturated fat and resists becoming rancid. The remaining ingredients in Nutella, such as cocoa, skimmed milk powder, soy lecithin, and vanillin, also do not require refrigeration. In the United States, Ferrero was sued in a class action for false advertising leading to consumer inferences that Nutella has nutritional and health benefits (from advertising claims that Nutella was "part of a nutritious breakfast"). In April 2012, Ferrero agreed to pay a $3 million settlement (up to $4 per jar for up to five jars per customer). The settlement also required Ferrero to make changes to Nutella's labeling and marketing, including television commercials and their website. ^ "Michele Ferrero | Italian industrialist". Encyclopedia Britannica. Retrieved 2019-03-17. ^ "Nutella hands £4m job to Krow ahead of relaunch". Brand Republic News. August 22, 2007. Retrieved March 18, 2011. ^ Mitzman, Dany (17 May 2014). "Nutella: How the world went nuts for a hazelnut spread". BBC News Magazine. Retrieved 18 May 2014. ^ Carridice, Adriel. "The History of Nutella (3)". NutellaUSA.com. Archived from the original on 18 May 2015. Retrieved 2013-01-28. ^ Carridice, Adriel. "The History of Nutella (2)". NutellaUSA.com. Archived from the original on 21 October 2015. Retrieved 2013-01-28. ^ Willsher, Kim (2012-11-12). "France's 'Nutella amendment' causes big fat international row". The Guardian. Retrieved 22 November 2012. ^ a b "Nutella diventa un francobollo" [Nutella becomes a stamp]. Yahoo! Finance (in Italian). 14 May 2014. Retrieved 18 May 2014. ^ Amabile, Flavia (15 May 2014). "I nostri primi 50 anni con la Nutella" [Our first 50 years with Nutella]. La Stampa (in Italian). Retrieved 18 May 2014. ^ "Nutella ha 50 anni, arriva anche un francobollo" [Nutella is 50 years old, a stamp is introduced]. ansa.it (in Italian). Agenzia ANSA Società Cooperativa. 17 May 2014. Retrieved 18 May 2014. ^ "Nutella – Breakfast for Champions?". Greenpeace.org. May 28, 2008. Retrieved March 18, 2011. ^ "Nutella Jar Ingredients". FoodWatch. ^ "Nutella and Nutrition: Food Pyramid and Guidelines". NutellaUSA.com. Retrieved 2013-01-28. ^ Narula, Svati Kirsten. "A frost in Turkey may drive up the price of your Nutella". Quartz. Atlantic Media. Retrieved 14 August 2014. ^ LaVito, Angelica (November 8, 2017). "Nutella's new recipe sparks #NutellaGate Twitter backlash". CNBC. ^ Squires, Nick (November 7, 2017). "Nutella fans go nuts over changes to recipe of beloved chocolate spread". The Telegraph. ^ a b Smithers, Rebecca (November 7, 2017). "Choc horror: fans outraged by Nutella's secret recipe change". The Guardian. ^ Carridice, Adriel. "The History of Nutella (1)". NutellaUSA.com. Archived from the original on 12 September 2015. Retrieved 2013-01-28. ^ Saxelby, Catherine. "Nutella. The full (correct) list of ingredients - Catherine Saxelby's Foodwatch". ^ "Nutella quietly changes its recipe in Europe, Canada, fans react". Global News. Agence France-Presse. November 8, 2017. ^ a b Knitstamatic (26 August 2012). "A Tale of Two Nutellas". Workpress.com. ^ "Frequently Asked Questions". Nutella.ca. Ferrero Canada Limited. Archived from the original on 2013-11-25. Retrieved 2012-11-26. ^ "Abre Ferrero primera planta en México". Reforma. Retrieved 2015-06-07. ^ "Ferrero Australia History". Ferrero Australia. Retrieved 2012-11-26. ^ "Stabilitmenti". Ferrero Italia SpA. Retrieved 2012-11-26. ^ "Où nous trouver". Ferrero France. Retrieved 2012-11-26. ^ "produktion". offizielle Website von Ferrero Deutschland. ^ "Ferrero prepares for major multi-million expansion in Russian markets". Confectionery Production. 22 October 2018. Retrieved 15 April 2019. ^ "A história". Ferrero do Brasil. ^ Amoroso, Ludovico (14 May 2014). "Nutella festeggia i suoi primi 50 anni e chiude le porte di Piazza Affari". La Repubblica. Retrieved 30 November 2016. ^ Akhtar, Khalil (April 4, 2017). "Hard nut to crack: The quest to make Nutella a bit more Canadian". CBC News. ^ "Deconstructed Nutella: nuts, cocoa – and 58 % sugar". The Guardian. January 20, 2017. ^ Peterson, Hayley (February 17, 2016). "Many parents are terrified to feed their kids Nutella". Business Insider. ^ a b c "How is Nutella Made". Wanttoknowit.com. 28 December 2011. ^ a b Triwood1973 (25 May 2008). "Chocolate Spread : How Its Made" – via YouTube. ^ a b "Nutella Australia". ^ "Nutella settles lawsuit from angry mom, drops health claims". CTV News. 27 April 2012. Retrieved 2013-08-29. ^ "Nutrition Facts and Analysis for Chocolate-flavored hazelnut spread". NutritionaData. Retrieved 2008-11-09. ^ a b "Chemical and Physical Properties of Food". wiki.UBC.ca. Retrieved 1 February 2018. ^ "Health Benefits of Hazelnuts". Kjhazelnuts.com. The Hazelnut Council. Archived from the original on 4 April 2017. ^ "What are Polyunsaturated and Monounsaturated Fats? - Your Guide to Diet and Diabetes". University of Illinois Extension. Archived from the original on 7 November 2017. ^ "Oils and Fats Handling/Safety/Storage". Recipetips.com. ^ "Kids' Cooking - Nutella Swiss Roll". ManoramaOnline.com. Retrieved 1 February 2018. ^ Tepper, Rachel (2012-04-26). "Nutella Lawsuit: Ferrero Settles Class-Action Suit Over Health Claims For $3 Million". Huffington Post. Retrieved 27 April 2012. Wikimedia Commons has media related to Nutella.